How do I edit my ClassTag Directory (i.e. how do I add / edit / remove parents and students)? Step-by-step instructions on how to edit your ClassTag class directory. The Class Directory provides you with one location to manage your class memberships, print invitations to join ClassTag, add students and parents to classroom, invite or remove teachers from your classroom, and even easily email parents. If you are looking to set up your class directory and just getting started with ClassTag, please review this post: How do I invite a parent (or parents) to use ClassTag? A family is considered connected if at least one parent has a valid contact email or phone number and we have confirmed successful delivery of communications to that contact. Once parents are invited to ClassTag with valid contact information, they receive all communications before creating the actual account on ClassTag and can accept the invite to join ClassTag at any time by following the links in the communications they receive. This ensures no parent is left out of communication even if they haven't taken action yet to accept the invitation. To know which parent has already signed up on ClassTag or who hasn’t signed up yet, please refer to this post: How do I know who has signed up for ClassTag from my class? If you see an exclamation point in your Directory or when you hover your mouse on the parent’s info and it says “Bad Contact”, it means that some students don't have any parents with contact information or the contact information for some of the parents is not valid. In your Directory, we will highlight the problem areas and you will be able to find suggested steps to ensure the parent can receive all the information. 1. On the Directory tab, click "Edit Directory". 2. Click the pencil icon next to the contact details. 3. Edit the email address or the mobile number and then click the "Update" button. In some cases when parent might have created an account already, you might see an error message "has already been taken". 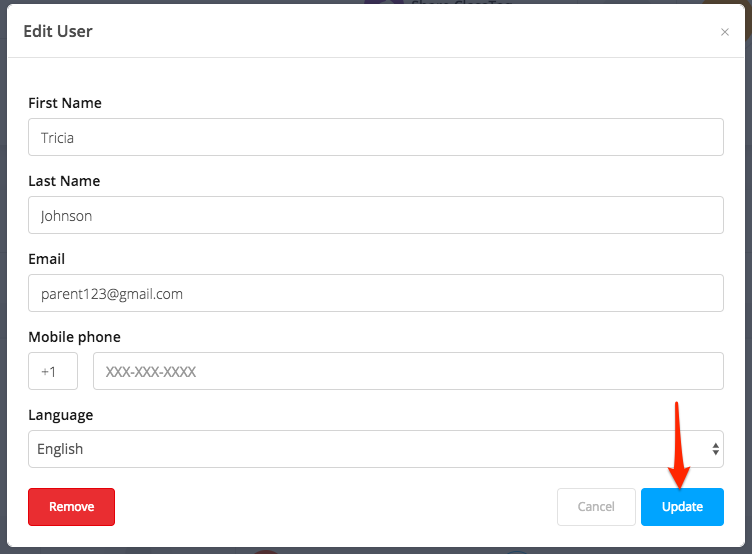 In order to invite this parent, please click on the "Remove" red button in the bottom left to remove the wrong account and create a new account to invite a parent with the correct email information. Remove a student by clicking on the trash icon next to student's photo. Please note that removing a student will remove all of the family from the class. Edit a student by clicking on student's name. Remove a parent by clicking on the pencil edit icon next to parent's information. Modify parent contacts by clicking on the pencil edit icon next to parent's information. Add a parent by clicking on the circle with "+" sign. Add a student by going to the bottom of the directory page and clicking on the "+ Add a Student" button. Only you as a teacher are able to see all the parents' email addresses. When parents sign up, they have the option of making their email addresses visible to other parents or not. This way they determine their privacy settings themselves. Parents can invite other parents or caregivers to their family on ClassTag, making it easier to ensure everyone has access even if you don't have emails or phone numbers for all family members. How do I invite a parent (or parents) to use ClassTag? How do I know who has signed up for ClassTag from my class?